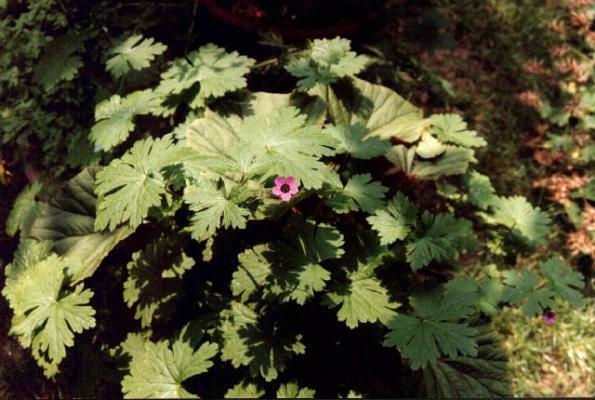 In August 1996 I bought a small plant, not very attractive, but with a unknown (for me) name: G. biuncinatum. It did not flower but produced a kind of small balloons, in which seed was formed. My first thought was: no flower, no pollination no fertile seed. I collected the mericarps, some fell in the pot and I left there. In November the plant died and I found two seedlings in the same pot. I was curious about what it was and re-planted them in 5 cm plastic pots in a mixture of potting soil and sharp sand. In my little greenhouse where I maintained a minimum temperature of +5 C, the plants grew slowly,even in the winter. In February they grow to a lenght of 20 cm and started to make the same small balloons as the mother-plant. To my surprise on the 9th of March I found one of the plants with a beautiful flower on top, purplish red with a dark heart, with petals of 8 mm length. 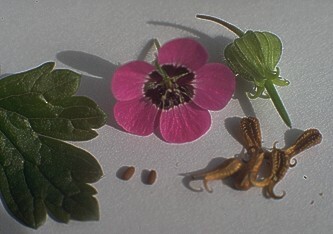 The flower is identical with the one in P. Yeo‘s “Hardy Geraniums”, which ensures to me that it is really G. biuncinatum. In the bubble-shaped and crumpled-looking mericarps that I collected I found nice oval seeds that I have sown in early February in a mixture of peat & sand. In a small box slightly heated, they germinated after a week; I repotted half in March. These lovely plants flowered up to the end of May, sometimes with 5 or 6 flowers. The plants produce many seeds. Before sowing I open the mericarp with a sharp scalpel, there is one seed in the centre of each mericarp, which can be freed easily. The plant needed to be supported with small sticks and reached a height of about 30 cm. See also a picture of the related species G. ocellatum. All images are © the photographer.